Sir Gawain is a familiar figure in Arthurian romance. Even as on the continent he was reduced to Launcelot’s foil, the oldest son of Arthur’s sister was considered in medieval England to be the best of Arthur’s knights. Malory, however, has displaced him from his customary place at the center of Arthur’s court. When Malory chooses to translate the Suite du Merlin (or the Post-Vulgate Merlin), he decides to tell a version of the legend in which Gawain’s father King Lot never reconciles with King Arthur, as he does in most histories of Arthur. Not only are the Scottish politics altered, but Gawain also enters the narrative not as the oldest son of a trusted ally but as the son of a perceived traitor who died in battle against Arthur. Furthermore, Gawain is consistently identified not with Scotland but with Orkney, which was not Scottish. He begins as an outsider, and he must fight to establish himself at Arthur’s court. In a way, then, Orkney becomes complementary to Cornwall. As we discussed in chapter 1, although Cornwall is near the root of Arthur’s kingdom—the place where he was conceived and part of the southern forces that are Arthur’s initial power base—it becomes increasingly distinct from and sometimes hostile to Arthurian England: it has its own king (Mark), it is home to Saracen knights (Segwarides and Palomides), and its own politics. Orkney starts out alien and hostile, but it becomes more familiar as Arthur increasingly allies with his sister Morgause and her powerful sons. 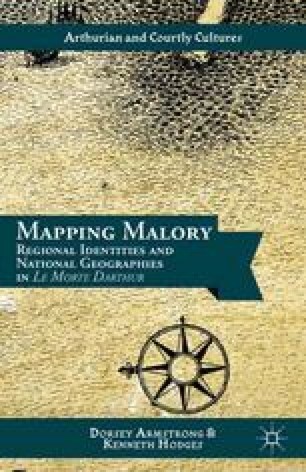 Our contention is that Malory deliberately wrote a “different” Gawain into his text in order to both ref lect and rewrite the geopolitical realities of his own day.